I'm running out the door for a meeting and have a great blog post planned for later this afternoon...as for now, I wanted to share this gorgeous bedroom discovered via DecorPad. Isn't is delicious?! Oh my word... I am obsessing over this bedroom! 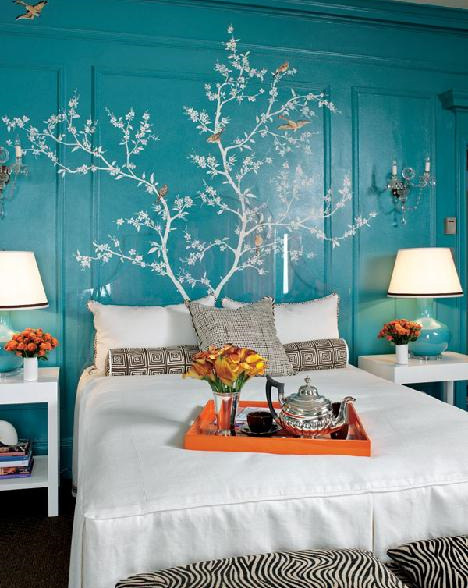 Love the whimsey mixed with modern patterns and color! This is one of my favourite palettes - orange and teal. What a gorgeous collection of colors, patterns and objects...would work wonderfully for a guest bedroom...thanks for sharing, Julie! It really is delish, I am a huge fan of teal and turquoise and this scheme is gorgeous! Oh yeah, I love that blue, but the tree makes it special! love the mixture of zebra and blue. it is fabulous. this is BOLD and i like it! oh, wow! the colors are to die for. love orange always... but would not have thought to put it with that gorgeous blue! is that the fox hotel? the hotel that has like a different theme for every room? love ur interior inspiration shots!